It is undeniable that Ariana Grande is one of the biggest pop stars on the scene right now. In just under a year, she has released two albums that have debuted at #1. She has acted in two Nickelodeon television shows, and even performed on Broadway. Ariana is known as a celebrity that has a big devotion to her fans, spending time DMing them on twitter, sending inspirational messages, and generally trying to be a good role model. 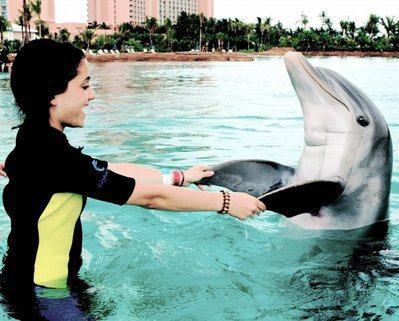 What most people might not know about her is that Ariana LOVES dolphins! Last night, Ariana’s facebook page announced that she will performing a concert on Friday, Sept 19th at 1OAK club inside the Mirage hotel and casino. The very same hotel that has been enslaving dolphins for 24 years without even a simple shade structure to protect them from the sun that reaches temperatures of 117F in the summer.The very same hotel that is responsible for the dolphin swim-with program regulations to be put on hold. It is possible that Ariana just has no idea about what is going on within the confines of this hotel. Even people in Las Vegas are oblivious to the fact that dolphins even live in the Mojave desert thanks to MGM resorts. Just last year, Ariana made a public statement denouncing SeaWorld and their use of cetaceans for captivity. Killer whales are just one type of dolphin. SeaWorld is tied to the Mirage because they have a “breeding loan” program, with 3 dolphins in Las Vegas arriving from SeaWorld. We also speculate the origin of the poxvirus to be the SeaWorld shipment of 2010. Ariana has proven that she is a reachable celebrity with a willingness to change, and a love for animals (ps- she’s vegan!). We would like to take the time to reach out to her with a couple of tweets in hopes she may rethink her choice of a concert venue next week, or at the very least- see the dolphins for herself, in their pathetic small pool, covered with skin lesions, and use her very powerful voice to become an advocate for their better care.